This is the place where I talk about things. What things? My unusually small chihuahua, or what I've bought for my apartment, or Providence, Rhode Island, or fashion in the 19th century, or books and writing, or anything else that comes to mind. 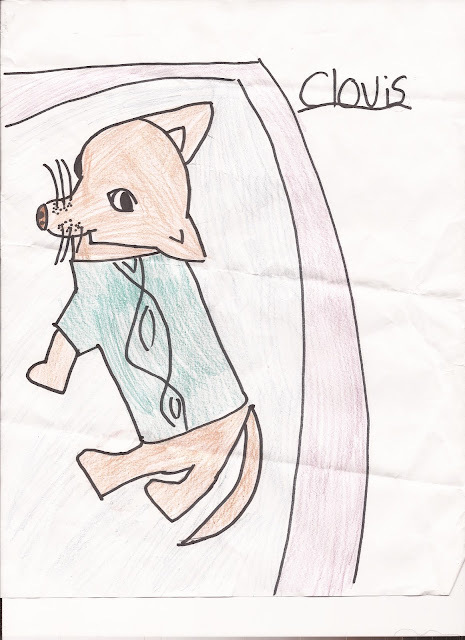 When I was in New York, I got this wonderful portrait of Clovis done by a close friend's daughter. I think the resemblance is really stunning. The picture captures the essence of Clovis. That eye cautiously turned to the viewer. That's Clovis. Thank you, Talia!! And he's wearing his favorite green sweater! Oh my gosh, that is priceless! You need to frame it! My first novel, The Rebel Wife, will be published by Simon & Schuster in February 2012. I have an MFA in Creative Writing from Wilkes University and a BA in History and French from Washington University in St. Louis. I live in Providence, Rhode Island, with my chihuahua, Clovis.